Delicious Funfetti cupcakes, topped with Buddy's elf hat. Fun, delicious, and you definitely won't be a cotton headed ninny muggins if you bring these to your events. Prepare the Funfetti cupcakes according to the mix’s directions. Most cake box mixes will yield 24 cupcakes. Allow to cool before decorating. Using an electric mixer, beat together butter, confectioners’ sugar, and milk. These ingredients will make up your buttercream frosting. Once the ingredients start mixing smoothly, add yellow gel food coloring. Continue mixing until tinted. Place yellow buttercream in a piping bag and frost a dollop of buttercream in the center of each cupcake. Set your piping bag aside. Tint your white fondant with green gel food coloring and knead. You may want to put cornstarch on your fingers to keep it from sticking. Roll 24 fondant spheres, about 1 ½ inches in size. Once the spheres are formed, start shaping them into ELF hats. To do so, flatten each sphere slightly then give it a point at one end. Curve the point to give it the illusion that the hat is ‘flopping over.’ Flatten the bottom and give it a triangular shape. Insert one toothpick in each cupcake, with about ½ an inch of it exposed. Insert your fondant hat through each toothpick. 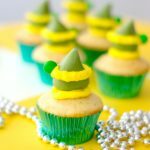 Frost a line throughout the circumference of each hat with your yellow buttercream. Insert one green M&M on the side of the hat. Serve and enjoy!